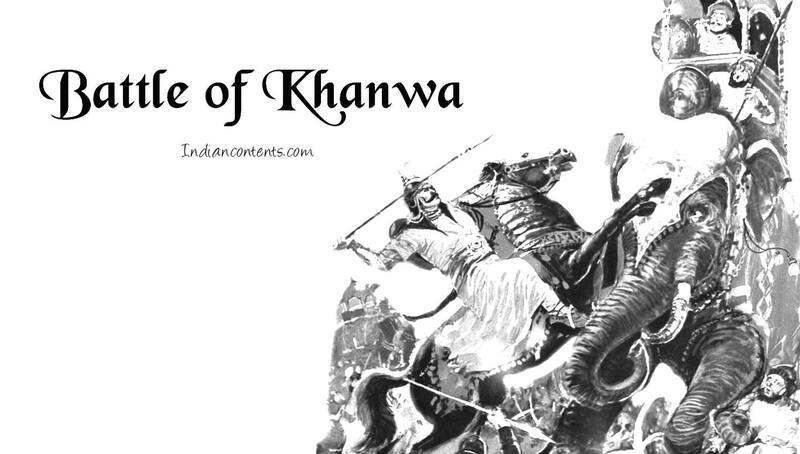 The Battle of Khanwa was fought between invading forces led by the first Mughal Emperor Babur and the Rajput forces led by Rana Sanga of Mewar. The battle was fought near the village of Khanwa, in Bharatpur District of Rajasthan, on March 17, 1527. The foundation laid at the battle of Panipat for the establishment of the Mughal Empire in India was strengthened by this battle. The first battle of Panipat was fought between Babur's forces and Ibrahim Lodi's troops on 21 April 1526. Ibrahim Lodi, the last ruler of the Delhi Sultanate was defeated in the battle, which paved the way for beginning of the Mughal era in India. Babur became the ruler of Delhi and Agra. 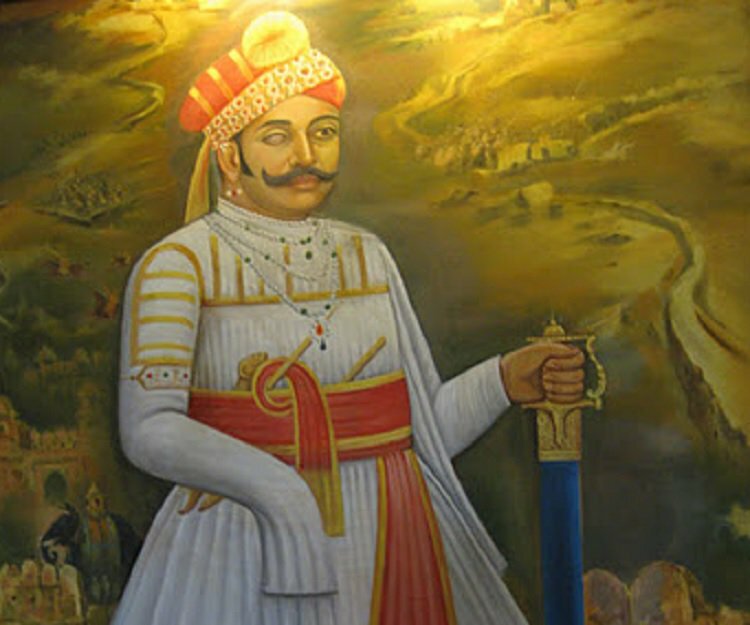 On the other side Rana Sanga had crushed the Gujarat and conquered Malwa and was now close to Agra. He heard that Babur had defeated Ibrahim Lodi and was now master of the Delhi Sultanate. 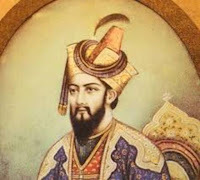 Rana Sanga thought Babur would also withdraw after seizing the treasures of city, but later realized that Babur was intended to stay and expand his rule in India. Later Rana Sanga advanced to Agra. On hearing this Babur sent Humayun with military detachments for the conquest of Dholpur, Gwaliyar, and Bayana (The strong forts forming the outer boundaries of Agra). The commanders of Dholpur and Gwaliyar surrendered their forts to Babur accepting his generous terms. But the commander of Bayana, Nizam Khan negotiated with surrender. Babur's initial military detachment to Bayana was also defeated and dispersed by Rana Sanga's forces. However later Bayana surrendered to Babur. Rana Sanga started building a formidable military alliance against Babur and succeeded. All the leading Rajput kings from Rajasthan, including those from Harauti, Jalor, Sirohi, Dungarpur, Dhundhar, and Amber joined Rana Sanga virtually. Medini Rao of Chanderi in Malwa also joined the alliance. Rao Ganga Ji Rathore of Marwar sent a contingent on his behalf. Further, Mahmud Lodi (brother of Ibrahim Lodi) joined the alliance with a force of 10,000 Afghans under him. Hasan Khan Mewat, the ruler of Mewat joined the alliance with a force of 12,000. Raja Khanzada Hasan Khan Mewati an ambitious Muslim Rajput ruler of Mewat also joind Rana Sanga. Then Rana Sanga sent his vassal Sardar Silhadi of Raisen to Babur and ordered to leave India. But Silhadi was bribed by Babur and made a deal that Silhadi would join Babur’s camp along with his men at critical moment of battle and thus defeat Rana Sanga. Silhadi went back to Rana Sanga and told Babur is intended to fight. The Rajput and allied Muslim forces led by Rana Sanga, met Babur’s army at Khanwa in 1527. Babur prepared a strong offensive-defensive formation. Rana Sanga, prepared in a traditional way, marched with an army of 120 chiefs, 80,000 horses and 500 war elephants. Battle started with an attack launched by Rana Sanga was fought for 10 hours. Rajput fought brilliantly and was successful in the beginning but the artillery used by the Mughal army changed the fate of Rajput’s in the battle. The Canons did the fearful execution. The cannon fire was new to the Rajput’s and the war elephants were not trained to fight against cannon. Elephants were terrified due to sound and smoke of cannon fire and this made the elephants in the Rajput army to scatter in all directions. Suddenly as per the deal with Babur, the defection of Silhadi and his contingent caused a split in the Rajput forces. Mughal Cavalry caused the maximum loss and Rajputs fled in every direction. Raja Hasan Khan Mewati died in the battle and Rana Sanga fled away from the battle ground and Babur stood victorious. The foundation laid at the battle of Panipat for the establishment of the Mughal Empire in India was strengthened by this victory and provided Babur a superior control over North India. The defeat of Rana Sanga caused fear in other kingdoms of the Rajputana and all the remaining kingdoms fell one by one without much resistance.